Perfect for family and couples! This house is almost 100 years old and we renovated it on July 2017. You spend your vacation comfortably. Close to subway Karasuma-Oike station, only three stops from Kyoto station. The location is convenient to do some sightseeing and shopping. 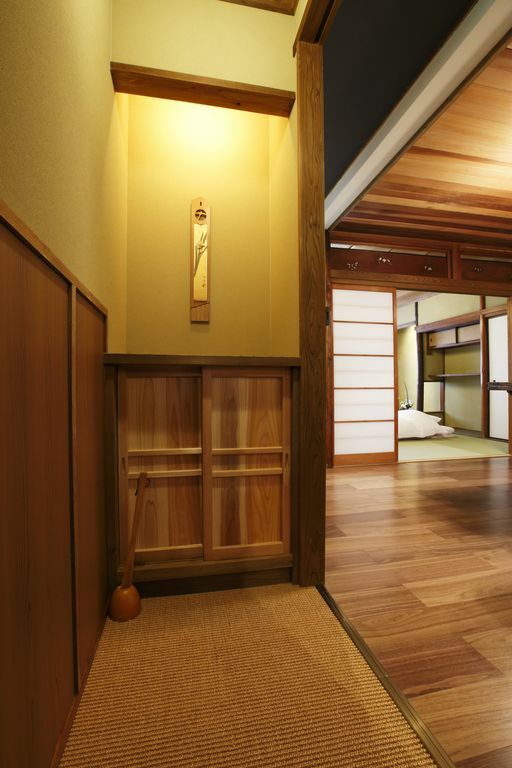 This property Satsuki is the lower unit of a two-storied Machiya townhouse. There is another unit on the ground floor and will be used by other guest. However you will not share any room except the main entrance hall. Person not registered for accommodation must refrain from staying overnight in the room. Please see our other listings in the In Sanjo-Kamanza area: Shimoza-an VRBO#514790 & Kamiza-an VRBO#514588. This house is almost 100 years old. We would like to leave this traditional house to posterity. We renovated the inside of the house but the outside, you can see the old Japanese style. The house is near to Karasuma oike street. On the street, a traditional festival is taken place every summer so this area has a history. We would like to share the history and would like to enjoy the culture by staying at the house. This property is upstairs, and there is no elevators. Stairs are steep. Our hosts were truly impressive and this beautifully renovated townhouse provided every comfort and need we had while traveling to Kyoto for 4 days. It was the perfect place to recharge after long days of temple sightseeing. The heated floors were a particular bonus. We would definitely reserve again. Thank you very much for such a warm, kind review. we really appreciate your heartfelt comments of our house and service. It would be our pleasure to host you again. This apartment has been tastefully restored, is beautifully warm with its heated floor and has all the facilities you could want. We were offered a free taxi to and from the station which we gratefully accepted, meaning we did not have to conquer crowded Kyoto's metro with our luggage. Mariko met us at the apartment and explained everything, her English being excellent. Our wifi was not working on the first day so she came around within the hour and sorted it out. We walked along very smart trendy streets (they look like back lanes) each night to find great restaurants and were able to get to all the attractions very easily. Nijo-jo castle is within easy walking distance as was the very smart shopping district along Shijo dori. Six days was not enough.